The Episcopal Musician’s Handbook is the essential tool for assisting clergy, musicians and laity in preparing meaningful worship in the Anglican tradition. Get a single copy for $39, or order multiple copies at a discount! See table below for details. Available for U.S. delivery addresses only. All prices are USD and including shipping and handling. For Canadian or international delivery, contact customer service. 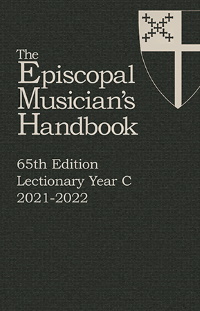 The Episcopal Musician’s Handbook assigns every Sunday and every major holy day of the year two facing pages. The left page contains the date, liturgical observance, customary color, collect, Sunday lections from the Revised Common Lectionary, proper preface, and hymn listings from The Hymnal 1982, Lift Every Voice and Sing II, and Wonder, Love, and Praise. The right-page grids are worksheets on which to plan service music. Extra planning pages are included for Christmas, Easter and Pentecost, and hymn checklists at the back of the book allow you to keep track of usage. Hymn suggestions are matched to the theme of the gospel, lessons, collect or season. The Episcopal Musician’s Handbook is your helpful guide for planning worship. by making an additional donation today. The charge will appear as The Living Church on your credit card statement.